The Open Access Book “Decision Making Under Deep Uncertainty: From Theory to Practice” has been released by Springer (Click here to download). This open access book focuses on both the theory and practice associated with the tools and approaches for decisionmaking in the face of deep uncertainty. It explores approaches and tools supporting the design of strategic plans under deep uncertainty, and their testing in the real world, including barriers and enablers for their use in practice. The book broadens traditional approaches and tools to include the analysis of actors and networks related to the problem at hand. It also shows how lessons learned in the application process can be used to improve the approaches and tools used in the design process. The book offers guidance in identifying and applying appropriate approaches and tools to design plans, as well as advice on implementing these plans in the real world. 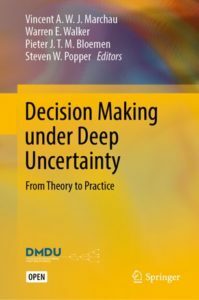 For decisionmakers and practitioners, the book includes realistic examples and practical guidelines that should help them understand what decisionmaking under deep uncertainty is and how it may be of assistance to them. Decision Making under Deep Uncertainty: From Theory to Practice is divided into four parts. Part I presents five approaches for designing strategic plans under deep uncertainty: Robust Decision Making, Dynamic Adaptive Planning, Dynamic Adaptive Policy Pathways, Info-Gap Decision Theory, and Engineering Options Analysis. Each approach is worked out in terms of its theoretical foundations, methodological steps to follow when using the approach, latest methodological insights, and challenges for improvement. In Part II, applications of each of these approaches are presented. Based on recent case studies, the practical implications of applying each approach are discussed in depth. Part III focuses on using the approaches and tools in real-world contexts, based on insights from real-world cases. Part IV contains conclusions and a synthesis of the lessons that can be drawn for designing, applying, and implementing strategic plans under deep uncertainty, as well as recommendations for future work.